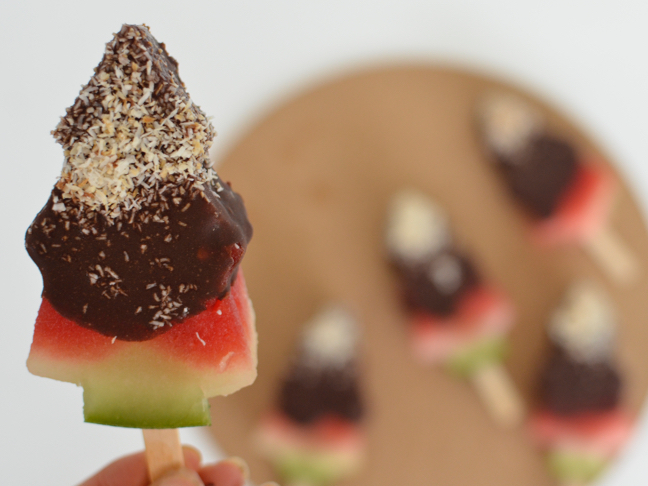 These watermelon Christmas pops are one of those recipes where if you make it once, you’ll be making it over-and-over again. They are such a hit with the babes. And you know, don’t be limited by your imagination or your cookie cutter drawer, make any shape out of the watermelon that works for you. I’ve made these plenty of times as circles and gingerbread men, because once the chocolate and coconut is on it’s a winner, right? Slice the whole watermelon into 4cm rounds and lay them flat on a chopping board. 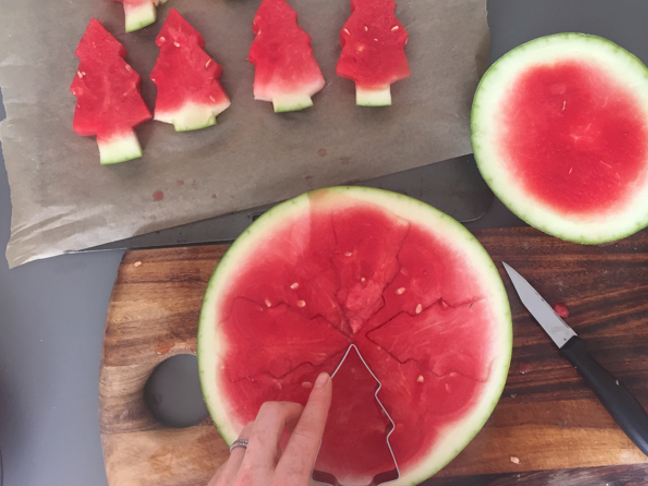 Using your cookie cutter, cut 10 Christmas tree shapes from the watermelon rounds and place them on a lined tray. 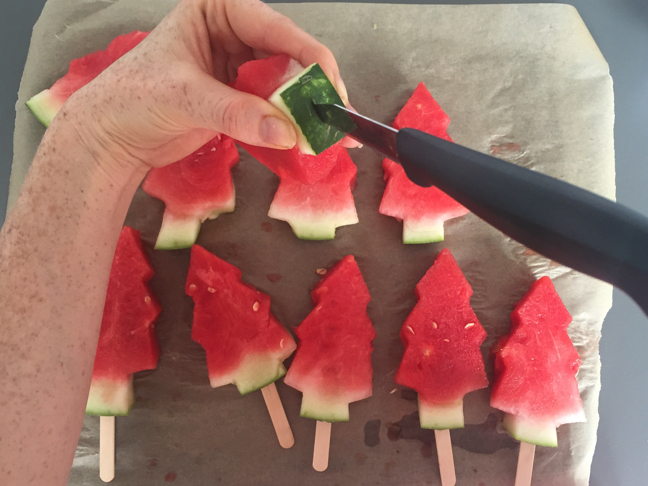 Then using a sharp knife, cut a little groove in the watermelon rinds and insert craft sticks into the base. Place the tray in the freezer for an hour or until the watermelon has hardened. 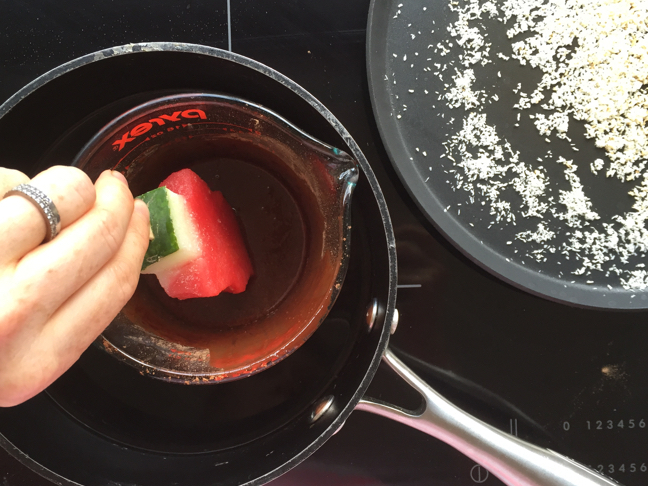 Once the watermelon trees are frozen, heat the coconut oil with the cacao and maple syrup over a low heat in a small saucepan. Stir until the mixture is runny. Taste to ensure it's sweet enough for you, adding a touch more maple syrup if you'd like to. Remove the trees from the freezer and dip each into the chocolate. Return them to the tray and sprinkle with the coconut. Return the tray to the freezer until ready to serve. It's always great to make your own chocolate at home but if you are short of time, substitute the chocolate ingredients for store-bought quality dark chocolate, it will still taste great.